When I walk into our Kindergarten room recently I enter in with a new outlook. I no longer am just wearing my principal hat I am now walking in with my parent hat as well. My daughter will be entering Junior Kindergarten in the fall and like all parents I am starting to envision what my hopes and dreams are for my little one in her first years of schooling. My hopes and dreams would be for my little one to thrive and flourish. I desire for her to thrive and flourish spiritually, academically, socially, and physically. I want her to play, learn, create, discover, sing, interact, dance, listen, laugh and giggle. I want her to jump into my arms at the end of the day ready to share everything that happened during her day. I know as an experienced educator that thriving and flourishing can only happen in a place where a child knows the routines and feels secure and safe. 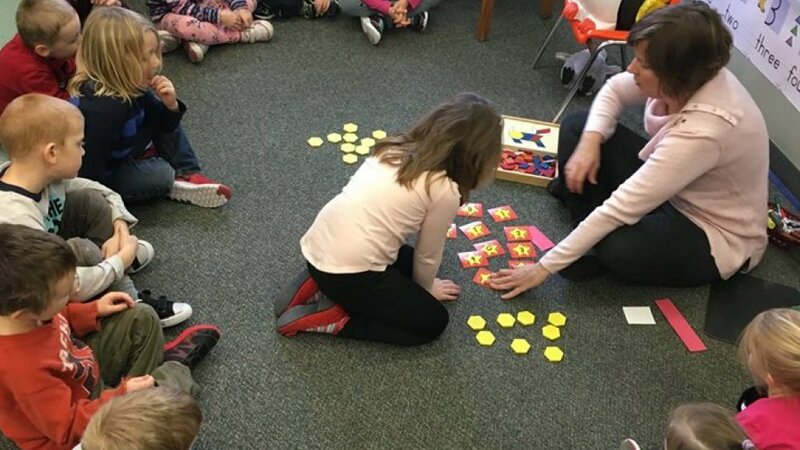 When I am visiting our kindergarten class I do see a group of students who are confident and comfortable in their space. Through their morning meeting time each child is warmly greeted with eye contact, a smile and by name not only by their teacher but by every child in the room. What a welcome! After a time of greeting the children are daily reminded of what kindness looks like and how to care for their friends and classmates. They are encouraged and pray together to have servant hearts and to not just care for themselves but to care for others and their classroom as well. They are learning how to live in community the way God has called us to live in community with each other. It is reassuring to know that the life lessons that I have already taught my little one in her preschool years are reinforced in school and valued as important. It is a beautiful thing to hear the hallways echoing with the sound of our littlest ones singing, “God is so Good” in the morning. Yes, I want my little one to be part of that choir. I also hear the voices of our kindergarten students as they are learning Psalm 139 together. What an incredible passage of scripture to place in the hearts and minds of ones so young. I want my daughter to know she is fearfully and wonderfully made by a Creator God who loves her and delights in her. Yes, it is school and I want my little one to thrive academically as well. I watch (sometimes in awe) as our kindergarten students move from learning the names and sounds of letters to reading one vowel words by the end of junior kindergarten and two vowel words by the end of senior kindergarten. They explore phonics and early literacy development through instruction, games, activities, play and even sometimes a little book work. I see them exploring numbers together in multiple of ways. I challenge you to find as many ways to represent a number as these little mathematicians can. At the top of the revised version of Bloom’s Taxonomy of Learning is creativity. This classroom is full of creativity! The artwork is big, bold, beautiful and plentiful! Stickers, paint, bingo dabbers, feathers, pom-poms, glitter and more are readily available. These little 4 and 5 year olds are encouraged to explore with pictures and with words, they already have their first journal. Let the creativity soar! I have the privilege of already knowing the #sonrisedifference before registering my daughter for her Junior Kindergarten year. If you have a little one at home starting Kindergarten in September I invite you to experience it for yourself by joining us for our Kindergarten Open House on Wednesday, April 25th from 9:15 to 11:45 am. Bring your little one and spend the morning with us participating in lessons, crafts, snacks, games, and play time (of course! ), a full kindergarten morning. Come and experience the difference a Christ-centred education can make for your family.